Tubeless Easy MicroSkin 튜브리스는 미래 부상하는 타이어 기술로서 속도, 편안한 승차감, 지면 밀착성, 펑크 방지 등에서 명확한 이점 보유. 쉬발베 특허인 Microskin construction은 쉽게 탈착 가능하고 현격히 경량화되었으며 추가적으로 개선된 구름 저항 그리고 펑크 방지, 고압 안정성을 보유. 튜브리스 이지 타이어는 튜브를 내장하고도 사용할 수 있지만 그 진가는 튜브리스때 발휘한다. It's a riding thrill. It's fast. It’s reliable. It’s light. The patented MicroSkin construction makes this all possible. 70 g less weight, 15 % less rolling resistance and improved cut resistance all around. This is the absolute top model from Schwalbe! You can also use the Schwalbe Pro One with a normal tube, but its true strengths are experienced in combination with Tubeless Kit as tubeless tyre. Evolution The very best possible highest grade materials and latest technology. MicroSkin The patented construction consists of a high-tensile micro fabric which is vulcanized together with the rubber compound and the carcass. MicroSkin envelops the entyre carcass and facilitates a fault-free Tubeless Easy operation. 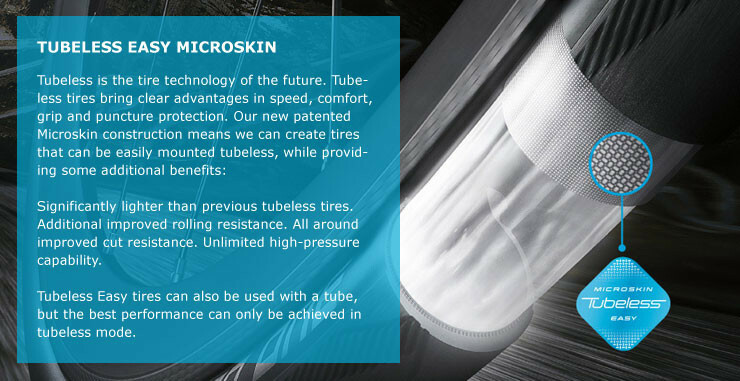 Tubeless Easy MicroSkin Tubeless is the tyre technology of the future. Tubeless tyres bring clear advantages in speed, comfort, grip and puncture protection. Our new patented Microskin construction means we can create tyres that can be easily mounted tubeless, while providing some additional benefits: Significantly lighter than previous tubeless tyres. Additional improved rolling resistance. All around improved cut resistance. Unlimited high-pressure capability. Tubeless Easy tyres can also be used with a tube, but the best performance can only be achieved in tubeless mode.